The Orchid Show captures the spirit of islands, beaches, and rainforests in places like the South Pacific and the Amazon. You’ll get a feel for the radiance of blooms under sunlit palm trees and in forest canopies teeming with color and life. Picture more than 10,000 orchids in bloom, paired with sweeps of bromeliads and birds of paradise—lush, vibrant, and intoxicating. As a nod to the importance of water in the tropics—rainforests can get hundreds of inches of rain a year—the Orchid Show features a “curtain” of falling water. The theme of water is implicit throughout, with a “waterfall” of Vanda orchids, a banca canoe, and small islands blooming with tall palm trees and orchids. Visitors can trade the cold and gray of winter for a world that is infused with the warmth and light of turquoise seas. Hours are from 10 a.m. to 4 p.m. daily, except for Thursdays, when the Show stays open until 8 p.m. for Orchids After Hours, where visitors can enjoy tiki cocktails, tropical-inspired bites and a nighttime viewing of the show. The first Orchids After Hours is on Valentine’s Day and will feature special desserts and prosecco and champagne splits. Each Thursday night, the menu includes sesame-ginger chicken pot stickers, coconut shrimp and honey-balsamic pulled pork sliders. A favorite menu item from last year returns with fresh tuna or salmon poke bowls served over rice, mixed greens, seaweed salad and other delicious toppings. Dessert consists of a petite key lime pie. The tiki cocktails are served in a take-home glass with a choice of rum cocktails, Hurricane Helcia or Orchids of Paradise. Non-alcoholic versions of the cocktails are also available, as well as soda, iced tea, water and bottled beer and wine by the glass. Tickets for the Orchid Show are as follows: Adults, $12 nonmember/$10 member; children (3–12 years) and seniors (62 years and up), $10 nonmember/$8 member; children under 3 are free. Parking fee applies. The discounted two-pack features two tickets and parking for one car. Regular hours are from 10 a.m. to 4 p.m. Open until 8 p.m. on Thursdays. The Show closes early at 3 p.m. on March 20. Visit https://www.chicagobotanic.org/orchid for more information. This rare book exhibition in the Lenhardt Library features beautifully hand-colored engravings of orchids found in tropical rainforests, cloud forests, and a particular orchid originally found in South America by botanical explorers Alexander von Humboldt (1769-1859) and Aimé Bonpland (1773-1858) in 1834. Hours are from noon to 4 p.m. Wednesday through Sunday. Free library talks will be held on Thursday, February 21, at 2 p.m. and on Sunday, March 10, at 2 p.m. Displays of orchids from the rarest of species to cultivated hybrids will be artistically arranged and vendors will have orchids for sale. Come join the Illinois Orchid Society at its spring show and sale. Individual orchids in 128 classes will vie for ribbons. Entries will receive "best of class" green ribbons, and the best-appointed plant in the show will receive the Chicago Horticultural Society Award from the American Orchid Society judges. Displays of orchids will be artistically arranged, and repotting services will be available. 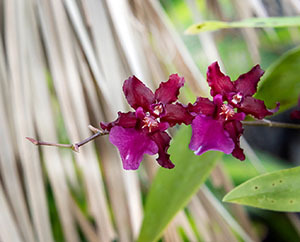 Families can take part in orchid-based activities for children. Vendors will also be on-site to sell orchid plants and related products—cut flowers, cultural books, hobby bags of the special Illinois Orchid Society (IOS) potting mix, raffle tickets, along with IOS memberships. Photographers who would like to capture the Show using tripods and monopods will be invited in before the Show opens on Tuesday mornings. Regular ticket fees apply, but only a limited number of tickets will be available each day. An image gallery for media download can be found here.